In the last post, we started to discuss what induction forging is and how the process works. Understanding the process from start to finish helps when determining whether certain applications of induction forging may be right for you. Here's part two of our beginner's guide to induction forging. After determining the power consumption necessary for an induction forging application, you'll have to consider the next main parameter -- the output frequency of the power source. While the heat is primarily generated in the surface of the component, it's critical to choose a frequency that offers the deepest and most practical penetration depth into the work piece. You should also keep in mind that it does take time for the heat to penetrate toward the center of the work piece. Furthermore, if too much heat or power is applied too quickly, it is possible to melt the work piece's surface while the core is still cool. 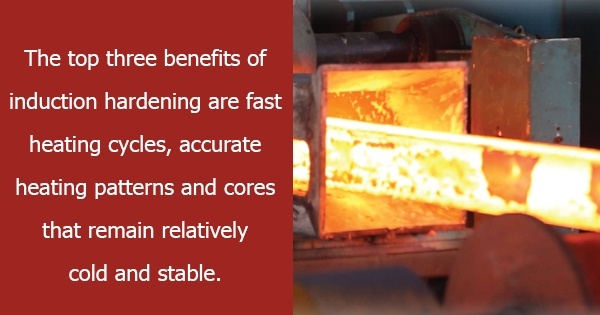 The top three benefits of induction hardening are fast heating cycles, accurate heating patterns, and cores that remain relatively cold and stable. Induction forging, however, also boasts many benefits. First and foremost, the process is highly calculated, and therefore, controllable. Traditional heating systems, such as gas furnaces, require a preheat and shutdown, whereas induction forging applications do not. Furthermore, the heat is available on demand with rapid availability. If a downstream interruption to production ever occurs, the power can easily be turned off, preventing unnecessary energy loss. Induction forging is also an energy-efficient process. This is a result of the heat being generated within the component as opposed to around it. The transfer of heat and energy is made much more efficient because the induction heating system only heats the work piece, not the atmosphere surrounding it. Ultimately, understanding the processes and benefits of induction heating and forging applications is essential to determining what is induction forging and whether or not it's right for your process. Keep an eye out for the next post, where we'll have the final installment of our induction forging guide for beginners. For more information about forging with induction, contact Ambrell Corporation.